Scientists are combining their expertise to change stem cells for nerve regrowth. Iowa State University researchers are developing technologies to promote nerve regrowth. 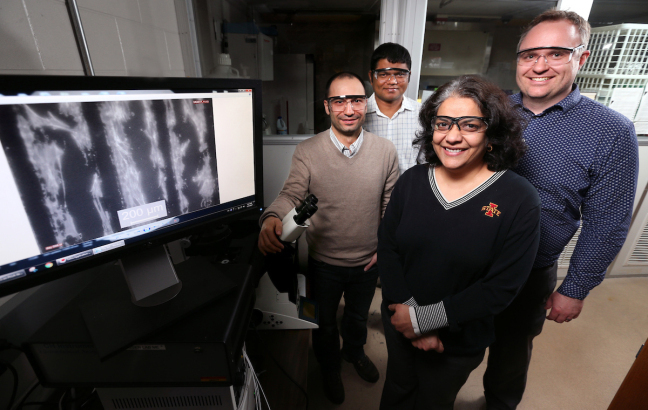 Iowa State University researchers, left to right, Metin Uz, Suprem Das, Surya Mallapragada and Jonathan Claussen are developing technologies to promote nerve regrowth. The monitor shows mesenchymal stem cells (the white) aligned along graphene circuits (the black). Larger photo. Photo by Christopher Gannon. AMES, Iowa – Researchers looking for ways to regenerate nerves can have a hard time obtaining key tools of their trade.